Selling or Buying a De Tomaso? Car manufacturer De Tomaso was created in 1959, in Modena, by Alejandro De Tomaso, former racecar driver from Argentina. Initially, De Tomaso built racecar prototypes, including a Formula 1 model for the Frank Williams team in 1970. The first road car was the Vallelunga model, presented in 1963, fitted with a 106-hp Ford Cortina engine, and built on an aluminum chassis with a glass-fiber body. The second model was the De Tomaso Mangusta, penned by Giorgietto Giugiaro and fitted with a 4.7-liter, V8, Ford engine. Produced from 1968 to 1970, the Mangusta was named after the arachnid mongosse, which was the main enemy of the cobrareferring to the AC Cobra. Pantera I and Pantera II models were the most popular models made by the brand in the early 1970s and early 1990s respectively. At the end of the 1990s, De Tomaso produced a model called the Guara in very few examples, due to financial difficulties. After filing for bankruptcy, the brand was bought by Chinese car manufacturer Consolidated Ideal in 2015. 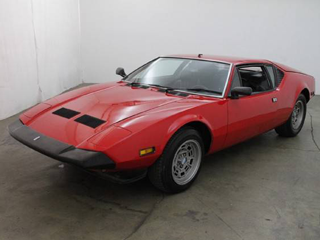 Looking to purchase a classic DeTomaso? Depending on what you’re looking for in your De Tomaso, The Beverly Hills Car Club team would be happy to give you a few tips for your purchase. The main issue is often rust with classic Italians, so be sure to carry out a complete pre-purchase inspection before you make a decision on a particular model. Get on the phone with the experts today and tell them if you’re looking for a classic for street fun, track, or both, if color matters and what your budget is. The team is dedicated to helping you find the perfect example for sale. In addition to their tips and advice, their Los Angeles showroom is the home for a large collection of classics, including De Tomaso models. Come visit The Beverly Hills Car Club team anytime and view the current inventory of classic cars for sale. Whether or not your dream De Tomaso is waiting for you in the showroom, the friendly staff will be very helpful and guide you through the research and buying processes to make your experience as easy and enjoyable as possible. We Also Buy Classic De Tomasos In Any Condition, Top Dollar Paid.